Home > Car Audio > Unloaded Sub Boxes > Single 8"
Are you looking for an enclosure to house an 8" subwoofer boxes? 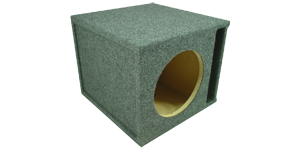 We stock high quality subwoofer boxes that are built to last. Made with MDF wood our boxes are sturdy, and will make your subwoofer sound great. If you want a high quality sub box that will make your system sound great, view our selection below.